How far in advance should I book my wedding date, for makeup and hair services? Weddings can be booked up to a year in advance, and no later than 3 months to ensure your date. When should I book for my makeup and hair Trial Run? Trial Runs should be booked 4-6 weeks in advance. Brides should have their headpiece and veil with them at the time. How should I prepare my hair and skin for the Trial Run? The brides hair should be clean and completely dry (washed the night before) in order to have the hair set properly. Brides should moisturize their skin prior to the Trial Run; this will enable the makeup to go on smoother and last longer. How long does a Trial Run last? The bride should give herself an average of 2-3 hours to ensure she receives exactly what she is looking for. What is involved in a Trial Run? The wedding Trial Run is very extensive. The Trial Run involves not only the bride but her mother, and her entire wedding party as well. The bride receives a complete makeup and hair service (with headpiece and veil). 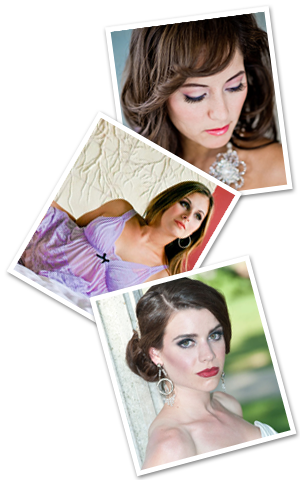 The bridal party, mother, mother in law and any flower girls receive a complimentary consultation regarding their makeup and hair with the makeup artist and hairstylist booked for the wedding. Besides bringing in my headpiece and veil to the Trial Run, do I need anything else? A very good idea would be for the bride and bridal party to bring in photos of makeup and hair (from bridal magazines) of ideas for the wedding day. Can your stylist work with very short hair? Yes, definitely, our team of stylists have extensive knowledge when it comes to all lengths of hair, whether very short or very long. What if I have short hair and want it to look longer, what can I do? We have the answer for that. "New Great Lengths Natural Hair Extensions" to ensure the bride can have her hair as long as she would like for her special day. For more info, prices and to obtain a free consultation for "Great Lengths" contact us. Do I need to have a headpiece and veil for my wedding? No, if a bride does not wish to have a headpiece and veil, that is not a problem at all. Some brides prefer something a little more simple, maybe some crystal or pearl pins (especially recommended for short hair) instead and no veil at all. This is definitely a personal preference for each individual bride; our stylists can work with you in order to create your vision for your special day. Do I need to take anything with me for the rest of my wedding day? Yes, the bride should take 3 very important items with her. These items are her lipstick, lip liner and some pressed translucent powder. These items will ensure she stays looking fresh all day long. She does not need anything for her hair. Do you offer in-home services for my wedding day makeup and hair? Yes! We have the largest team of freelance makeup and hair stylists that strictly specialize in doing in-home services all over the GTA. The Trial Run can also be done in the comfort of the bride’s home. How do I book bridal services? Please contact The Montana Team directly at 289-270-5417 or you can feel free to email us through this site, please see our contact page for more information. Due to our busy bridal season, please allow 2-3 business days for a proper response. Let’s face it, none of us have perfect hair or skin. Our guide will give you tips on what you can do in the months ahead of the big day, to get you looking and feeling your best. Following a few simple steps in your day to day life will help you achieve healthy glowing skin, and soft shiny hair. Caring properly for your skin is a good starting point for great looking skin. Adopting a good skin care routine of cleansing, toning and moisturizing with products formulated for your skin type will help keep skin clear and fresh. Wash morning and night, and ALWAYS remove makeup before going to bed. Be sure to use a good quality lip balm, or lip moisturizer regularly. Lip colour bleeds and fades on dry, chapped or cracked lips. Gently exfoliating lips with a soft bristled toothbrush will remove flakiness and reveal softer smoother lips. Facials are a good way to bring out younger looking, healthier skin. If you already have a facial routine, stick with it. If facials are new to you, begin several months prior to your wedding day with a facial every 4-6 weeks. The last facial should be done at least a week prior to the wedding day, to avoid any flare ups or redness. Don't forget the skin on your body, especially if you plan to wear a strapless or sleeveless gown. Gently exfoliating 2-3 times a week with a body scrub or loofah will remove dry dead skin and give skin a radiant glow. Moisturizing your body daily will keep skin soft and supple. Once a week, take a warm bath and moisturize while skin is still damp, this allows the moisturizer to absorb more readily, and a soak in the tub will help relax tense muscles and relieve stress. Stay out of the sun or tanning salons in the weeks leading up to your wedding and absolutely no tanning creams. Drink plenty of water. Staying well hydrated not only flushes your skin of toxins, but also keeps skin nourished from the inside out. Have your eyebrows waxed and shaped by a professional several months in advance, making adjustments to get the look and shape you desire. The final waxing should be done several days prior to the wedding to allow any redness or bumps to subside. Strays can be tweezed the day before the wedding. Avoid harsh styling products, especially those that contain alcohol, they can dry out your hair, making it brittle and prone to breakage. Trim your hair regularly. Trims every 4-6 weeks will remove dry damaged hair, and split ends. Hair will be smoother and softer to the touch. A final trim should be done 2 weeks before your wedding day. Don't do anything drastic. If you wish to try a new hairstyle or new colour, do so several months before the wedding. You'll have time to have the colour corrected, or style changed. Hair colour touch ups, and highlights should be done 2 weeks prior to the wedding day. This allows colour to settle for a more natural look.